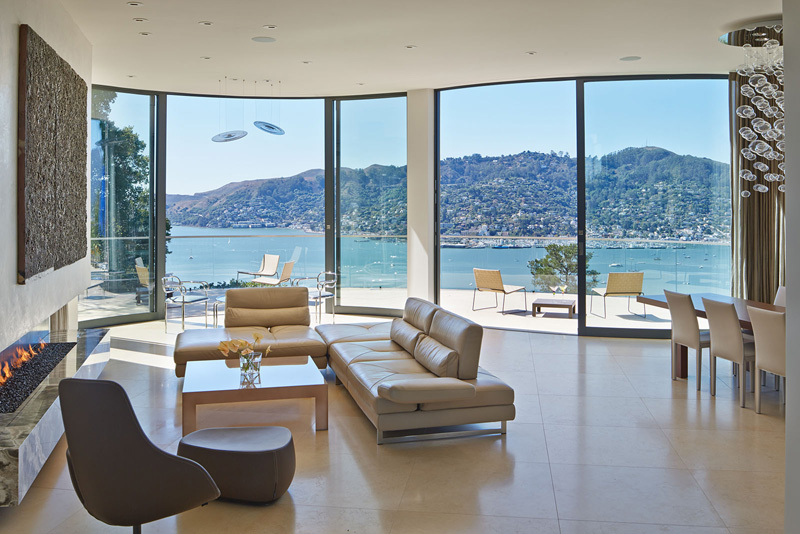 Polsky Perlstein Architects have designed the Belvedere Residence, that overlooks San Francisco Bay. Our clients came to us asking to create a custom home that would capture light, views and celebrate their life together. We worked closely with the clients to create a home of their dreams, and more. 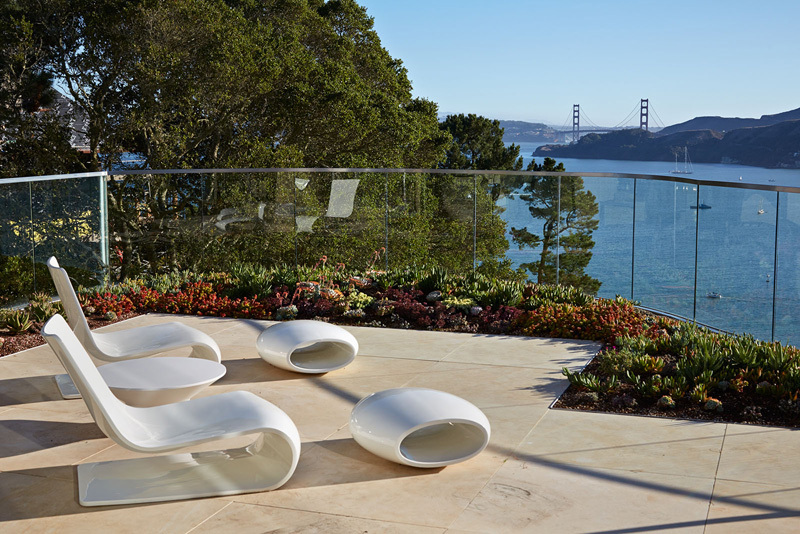 The site has South and West views over the San Francisco Bay toward Sausalito and the Golden Gate Bridge. 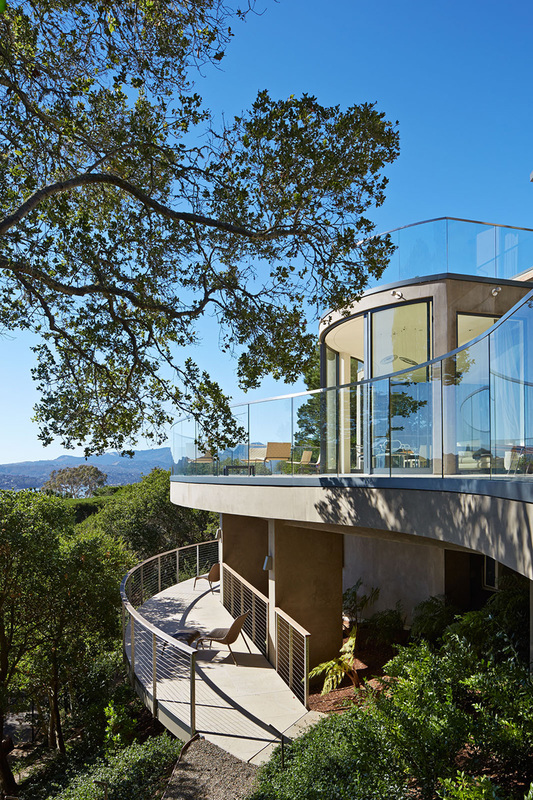 With a desire for connecting the home to the outside on both levels, the Main Level has continuous windows and doors on the western elevation opening to a spacious terrace with sweeping views from the Golden Gate Bridge to Mt Tamalpais. The Kitchen opens to a more intimate, eastern, landslide terrace with spa and fire pit. On the Upper Level, both the Master Bedroom and Master Bath open on a roof terrace complete with living roof overlooking the western views. We created an elliptical volume that serves as the central hall satisfying the clients’ wish to have an entry tower. This central hall serves as the connection point to the office hall, Kitchen, Great Room and Master Suite via stairs to the Upper Level. 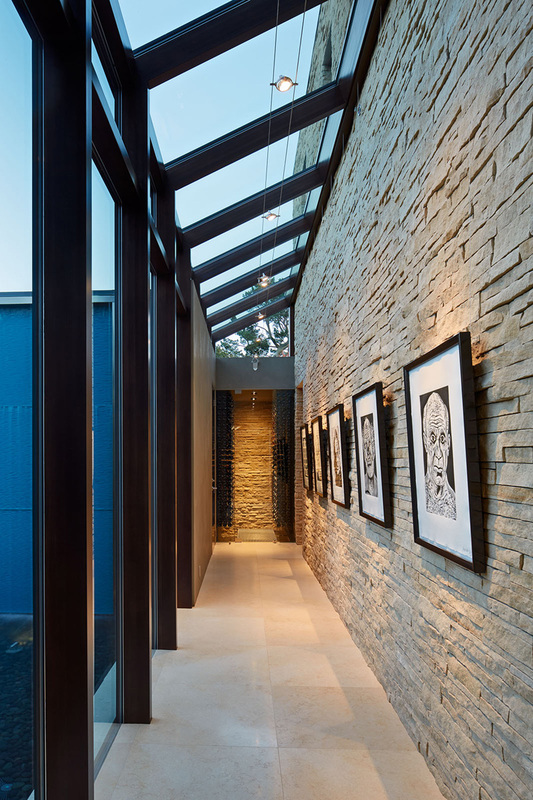 With its coved upper walls and floating disc suspended below skylights in the roof above, the ceiling of this space takes on a dynamic that makes it difficult to discern whether the ceiling plane is above or below the cove. 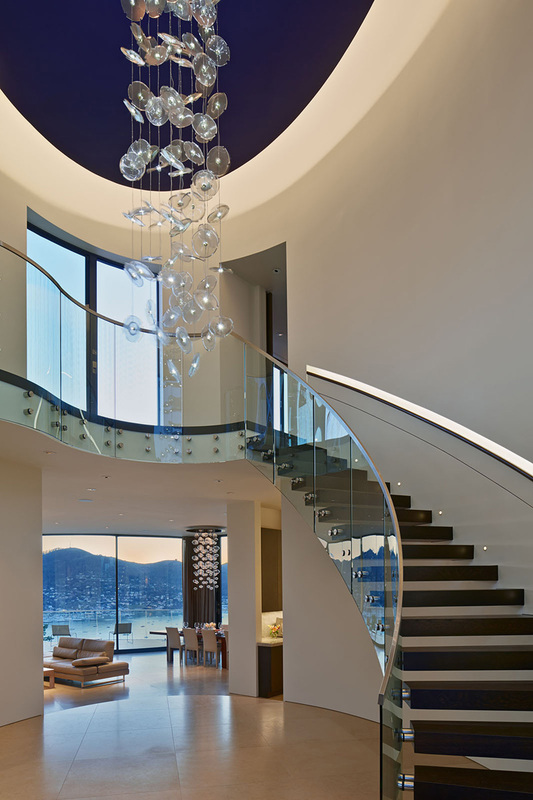 The curved main stair is cantilevered from the wall and includes a curving glass guard rail and a recessed, backlit handrail within the wall plane. The Main Level Great Room contains both Lining and Dining spaces adjacent to the Kitchen. 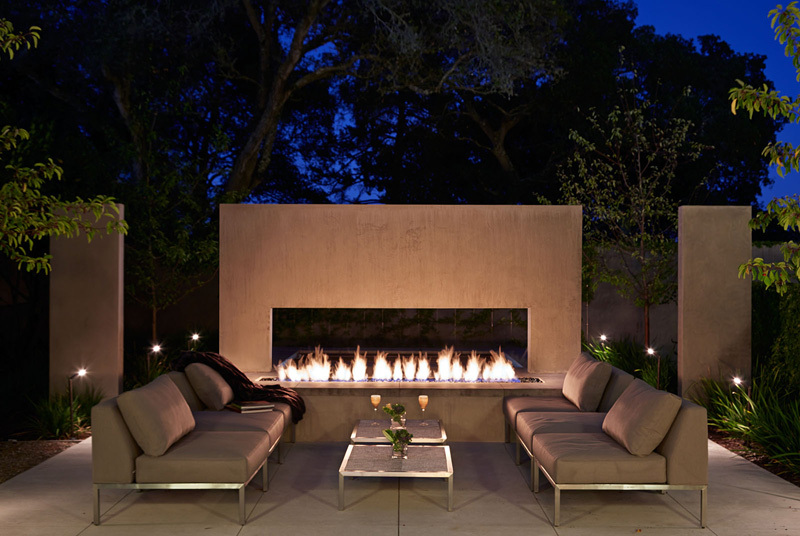 The Living area has a 8’-0”-long gas strip fireplace and curved sliding doors to the terrace. 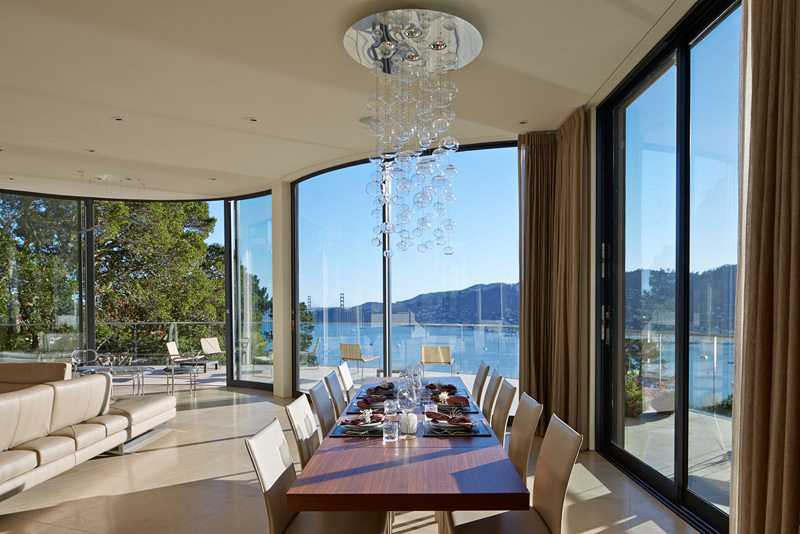 The Dining area has additional curved sliding doors to the West and pocketing sliders to the North to take in the view of Mt Tamalpais. To the East, the Kitchen has a back-lit Onyx island and pocketing sliding doors that open onto the Spa Terrace. 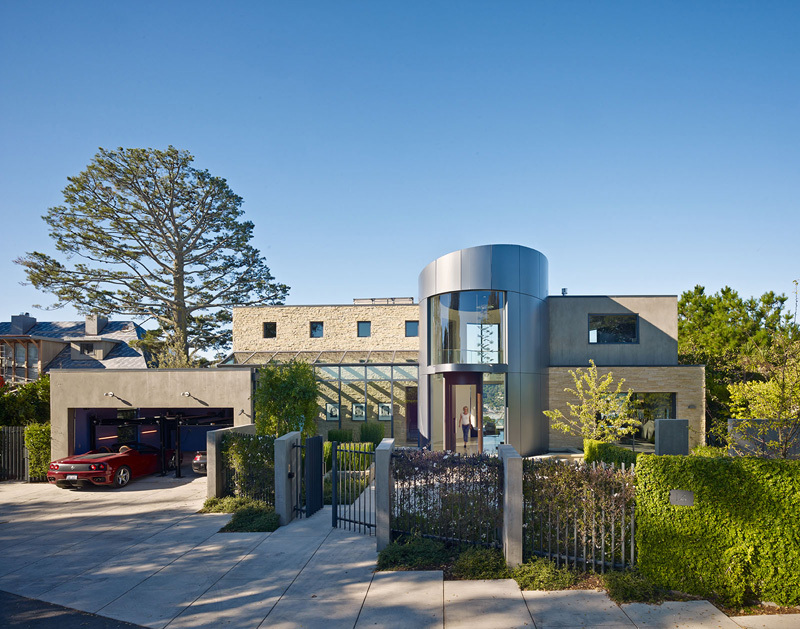 Additional spaces on the Main Level include His + Her Offices, each with its own bathroom, a glass-enclosed wine room, an AV Room and a garage with car lifts for four cars. 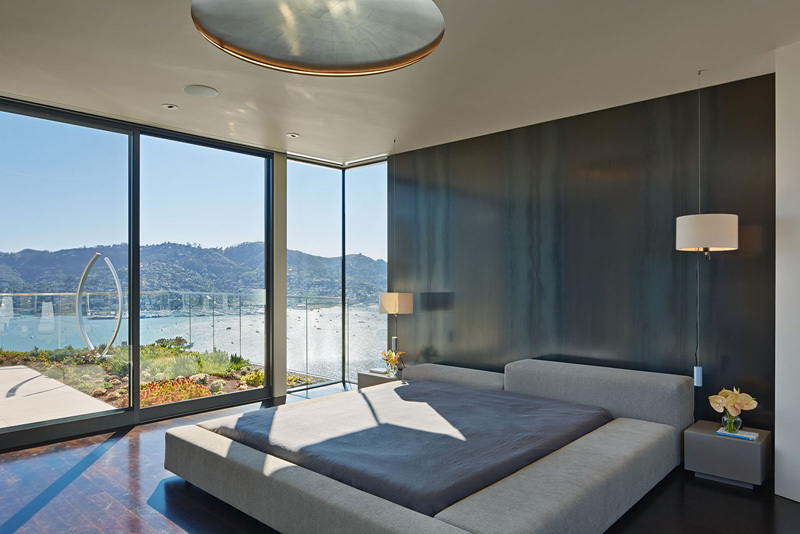 On the Upper Level, The Master Bedroom features a hot-rolled steel bed-wall. 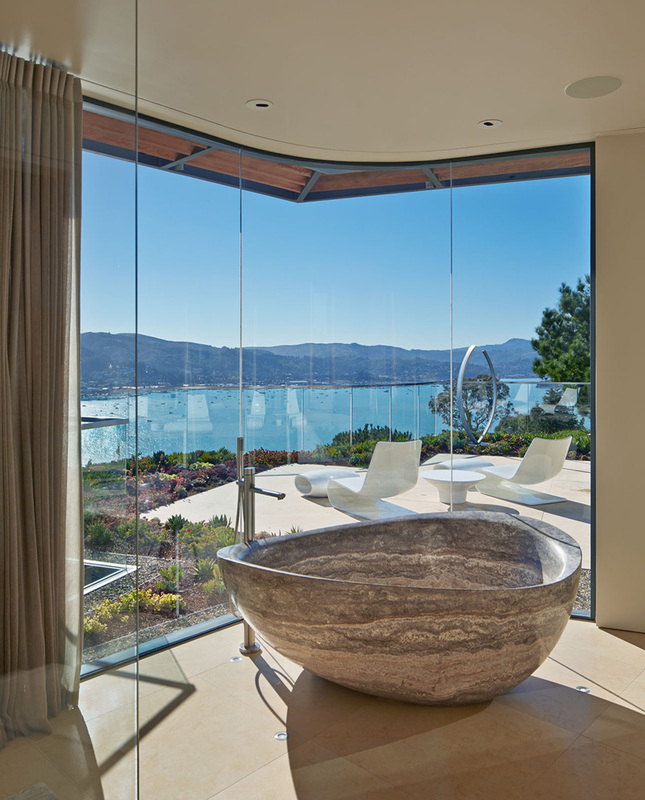 The Master Bath includes a tub carved from a single block of Silver Travertine and vanities upholstered in shagreen. Her Closet includes acrylic cubes lit with LED strip lights to showcase her shoe collection. To the greatest extent possible, interior spaces take advantage of amazing views, light and air, resulting in a spectacular home.